This ecoregion cannot be defined by the usual parameters, as it includes the open ocean over the continental shelf from three to 200 miles offshore from the Washington coast. Inshore waters are included in their adjacent terrestrial ecoregion. The continental shelf slopes gradually westward to its outer edge 30-40 miles off the Olympic Peninsula. From there the sea floor plunges steeply to a depth of 9,000 feet some 70 miles offshore. The surface of the ocean is more or less flat, but the irregular marine topography of canyons and ridges below causes local upwellings that lead to areas of high productivity of marine life, which in turn leads to concentrations of marine predators, including birds. Generally cool and wet, although this has no influence on the fauna. Surface waters provide a fairly uniform habitat, but with local variation because of upwellings and convergence lines that provide concentrations of prey. 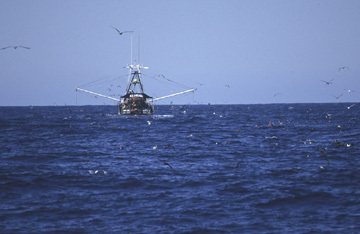 The ocean is too deep in this region to allow bottom-feeding by seabirds. Human impact is mostly indirect on this ecoregion. No widespread habitat destruction has occurred, but fisheries activities may reduce the prey base for seabirds. Fisheries exert intense pressure on populations of harvested species and in some areas also destroy bottom habitat; they may disrupt entire food webs. Global warming may have even greater effects on certain fish and invertebrate species that are important prey for birds. The impact of increasing ocean pollution is unknown, but periodic oil spills can kill large numbers of diving birds. On the positive side, fish-processing boats attract large numbers of seabirds.